حیدرنتاج, وحید. (1392). طراحی باغ مستوفی به سبک ایرانی. مجله علمی-ترویجی منظر, 5(22), 10-13. وحید حیدرنتاج. "طراحی باغ مستوفی به سبک ایرانی". مجله علمی-ترویجی منظر, 5, 22, 1392, 10-13. حیدرنتاج, وحید. (1392). 'طراحی باغ مستوفی به سبک ایرانی', مجله علمی-ترویجی منظر, 5(22), pp. 10-13. حیدرنتاج, وحید. طراحی باغ مستوفی به سبک ایرانی. مجله علمی-ترویجی منظر, 1392; 5(22): 10-13. دکتری معماری، گروه معماری دانشگاه مازندران. Assistant of Architecture, University of Mazandaran, Iran. Here existed Tehran and its gardens; there were many gardens in Tehran at the period of Ghajar dynasty which was designed by original pattern of Persian garden. North highland of old Tehran was full of Persian gardens built by noblesse of Ghajar; but those gardens destroyed due to city growth and development. One of these gardens is the Mostoufi garden in region 3 of the Great Tehran (Vank village of old Tehran). At the present time,this garden is named Vanak with an appropriate planting used as public green space. Mostoufi garden of Tehran was one of the largest gardens of the Ghajar dynasty in which the old buttonwood trees are only worthiness of garden. Due to garden demolition and performance and lack of suitable pattern of Persian garden in Tehran, authorities have decided to reproduce Vanak garden by presenting features of Persian garden and perform the original property of Iranian gardens at transnational scales. 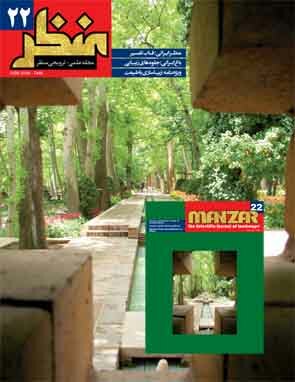 This paper recounts the history of Mostoufi garden, problems of design and construction; and influence of Persian garden property in various part of Vanak garden.